Are Fast Food Salads Better than the Burger Combo? One of the most popular weight loss tips is choose a salad instead of the burger and fries. But without considering the salad’s nutritional content many are actually choosing salads that have more calories, fat and sodium than the burger and fries. 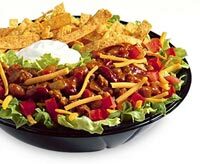 Many fast food salads contain over 750 calories, with over 40 grams of fat per serving. To add to these numbers their sodium contents are over 1300mg and when the average adult’s daily sodium count is only 2000 these numbers are catastrophic. Watch the Sodium content – a fast food salad should contain less than 1000mg of sodium, any thing more is too much sodium based on your daily sodium intake. Why eat more than half your sodium content in one meal. You will have to wash it out with a lot of water to stay off bloating. Beware of the Salad Dressings – the salad should have a low fat and low calorie dressing. Many fast food salads are healthy before you add the dressing. Some of the dressings alone make up over half the calories in a salad. Skip the Toppings – watch out for croutons, breaded chicken, cheese, bacon, taco shells and sour cream these are all calorie rich toppings that will take a healthy salad over to the dark side. What’s it Made of – choose salads that offer fresh vegetables with a good base like Romaine and Leaf Lettuce. A salad filled with colorful vegetables like tomato, carrot and green pepper will have a lot of vitamins and minerals. These salads when topped with a vinaigrette and some grilled chicken will be well under 500 calories with low sodium and fat contents. Check your favorite fast food restaurants’ web sites for nutritional information and salad options. Knowing what you are getting ahead of time is the best way from making a fast food salad mistake. The best way to lose weight is to be informed, make healthy choices and stay on track of your weight loss goals.